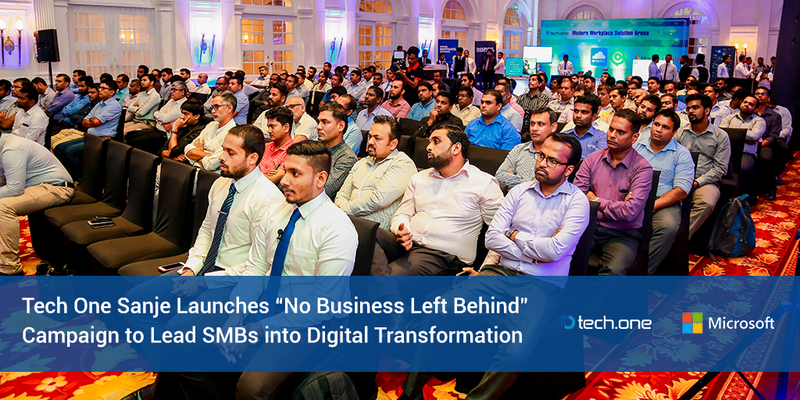 SRI LANKA, Galle Face Hotel, 10th May 2018 – Tech One Sanje in partnership with Microsoft, kicked off an event to launch the “No Business Left Behind” Campaign to fuel the movement in leading Small to Medium Enterprises (SMBs) towards digital transformation. The event featured interactive sessions on cloud technology and cybersecurity which were conducted by industry experts and was participated in by over 150 IT Managers and CXOs from SMB companies in Sri Lanka. Ashiq Niyaz, SMB Territory Channel Manager from Microsoft Sri Lanka and Maldives shared his thoughts what Digital Transformation for enterprises in Sri Lanka is about, while highlighting “Be Great in What You Do” concept. Ruvini Bandara, Account Technology Strategist at Microsoft Sri Lanka and Maldives, also did an in-depth session in security and demonstration to showcase what a security breach looks like. To cap off the evening, Gayan Wimalarathne, Technology Specialist at Tech One Sanje, spoke about Cloud Technology and its security aspect while Nasif Nazim, Business Development Officer at Tech One Sanje discussed Enadoc, a Document Management System, and its security and future developments.